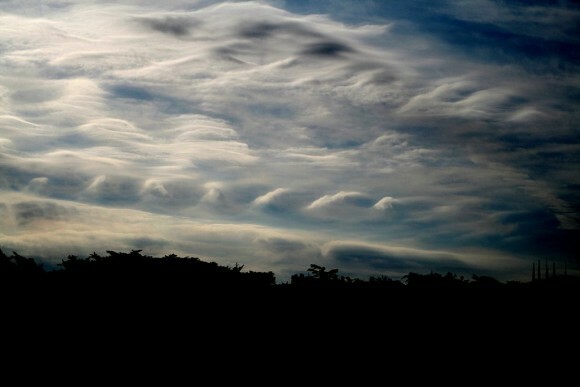 Clouds that look like ocean waves. What is it? Van Gogh clouds! Like breaking ocean waves. Here’s a special kind of cloud known to scientists as a Kelvin Helmholtz cloud. These clouds look like breaking ocean waves, with the rolling eddies seen at the top of the cloud layers usually evenly spaced and easily identifiable. Kelvin Helmholtz clouds are named for Lord Kelvin and Hermann von Helmholtz, who studied the physics of the instability that leads to this type of cloud formation. Earth isn’t the only planet with Kelvin Helmholtz clouds. Here they are on Saturn; Jupiter has them, too.